The climbing assay is frequently being applied in the context of contemporary Drosophila research on ageing and neurodegenerative diseases (ND). Here we will briefly explain why this research is being carried out in flies, and how such research in the tiny fly can help understand processes of ageing or ND. For further info on this topic, please have a look at our school journal article “Fruit flies in biological research” and a number of lay articles and films listed on the Manchester Fly Facility webpage. As explained on the “Why fly” page, flies and humans have many genes in common, which is due to their shared evolutionary history. Therefore, many of the genes involved in nervous system development and function in humans, or underlying human ND, are often existing in very similar forms in flies. The fundamental biological roles of these genes (e.g. why their mutation causes nerve cells to die) can often be worked out much more efficiently in flies than in mammalian models or humans, due to the many important experimental advantages provided by Drosophila (see the “Why fly” page). Once understanding has been gained in the fly, this knowledge tends to accelerate research efforts in higher animals and humans (Bellen et al., 2010, Nat Rev Neurosci 11, 514ff; Prokop, 2016, Biol Sci Rev). 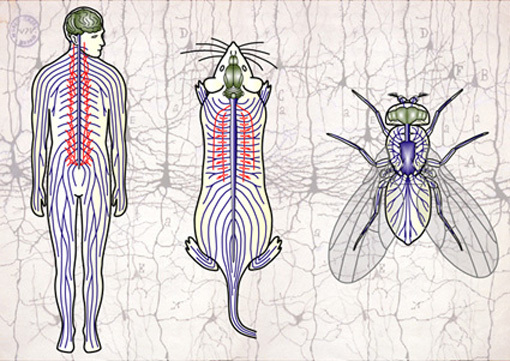 When comparing the size of a fly and a human you might not think that their nervous systems have much in common. However, the most basic features of the human and fly nervous systems are very much the same, and at the level of nerve cells the commonalities are impressively high. In the Drosophila brain, it is much easier to recognise and study individual nerve cells, and there are many sophisticated tricks for such studies and highly detailed maps of the fly brain have been developed. 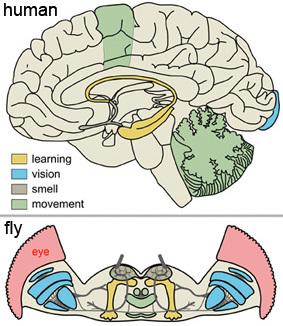 This makes the fly brain a great model to unravel fundamental principles of nervous system development, function and disease, many of which will apply to higher animals. How can we use Drosophila for ND research? Flies only live for two months, so you might wonder why their neurons should be affected by ageing or ND. After all, symptoms of ND in humans often become manifest only after many decades! However, flies do not only live shorter, they also age quicker, and research into ageing and ND is therefore possible in flies. This said, it would be wrong, misleading and irresponsible to overstate the possibilities of the fly model for this research. The fruit fly is NOT a mini human! For example, the fly is utterly unsuitable to study personality loss observed in Alzheimer’s Disease patients. However, Drosophila is a powerful model to advance our understanding of the cellular mechanisms that can explain why nerve cells die in that disease – and this process remains very poorly understood to this day, in spite of its important medical applications. In conclusion, fruit flies are useful to study the fundamental biological processes underlying ND, but not their mammalian- or human-specific aspects. Undoubtedly, Drosophila is an excellent model organism for studies of fundamental genetic and cellular mechanisms (see the “Why fly?” tab). For example, in the context of ND it can be used to unravel fundamental genetic and cellular mechanisms which can cause neuronal decay. Using fruit flies as “test tubes” to this end becomes increasingly important, because the technical advances in human genetics have started to deliver more and more genes with likely links to familal/inherited cases of ND. However, often we know next to nothing about the fundamental functions of such newly pinpointed human genes. Since they often have a close relative in the fly genome, Drosophila offers an efficient and cost-effective means to pioneer their functional investigation. Drosophila is cheap and easy to keep in large numbers, and is therefore highly suited to search for new genes contributing to a disease process. The key strategy is to develop a fly model of a disease. For example, there are tricks to bring mutant human disease-linked genes into flies, and often these flies start to display symptoms which resemble fundamental cellular abnormalities described in clinical reports of human patients. Once established, such ND models can be used to “screen for gene mutations” which make the disease symptoms worse or better, indicating potential roles within the disease process. These candidate genes can then be functionally analysed in flies and higher model organisms (e.g. mice). Furthermore, it can be tested whether mutations in these genes are found in patients suffering from this particular ND. If there is a correlation, these mutations would constitute a new familial form of this ND and be included in the genetic screening procedures of patients. Some successful examples showing feasibility of this fly-driven approach are given at the bottom of this page. Fly disease models can also be used to screen drug collections in search for candidate substances that might provide a path to future treatments in humans, following the same logic and strategy as explained for genetic screens above. It seems a sensible strategy to carry out cost-effective pioneer screens in a fly disease model first, to pinpoint candidate drugs that can then be tested in models of higher animals, such as mice. Typical symptoms observed in fly models of ND are holes occurring in their brain tissues, or flies loose their motor activity. Therefore, the climbing assay provides a powerful means to assess whether ageing or disease-struck flies are loosing their mobility. As explained above, these flies can be treated with drugs or manipulated genetically, and it can be tested whether these interventions worsen or improve their performance as compared to untreated controls. An overview of fly contributions to the field of ND has recently been published (Jaiswal et al., 2012, Annu Rev Genet 46, 371ff), and a few examples are explained in simple terms below. This list is only starting to be developed and we invite you to send in any further suggestions that could be added to the list. Please, contact Andreas.Prokop@manchester.ac.uk. Human PINK1 and Parkin are two genes linked to familial forms of PD. Through research in Drosophila it was discovered that both genes seem to act together in one common process, which is the disposal of unhealthy mitochondria. When one or both of these genes are mutated, unhealthy mitochondria cannot be removed and, eventually, damage the neurons. Clinical reports on human patients corroborate this hypothesis, but the precise mechanisms through which these genes link to neurodegeneration still need to be further explored. For this, research in flies provides a powerful means and is therefore actively capitalised on. Find more information in this review on the Parkinson’s UK website or this scientific review: “Whitworth AJ, 2011, Advances in Genetics, 73:1-50“. Many cases of frontotemporal dementia and motor neuron disease, as well as other neurodegenerative diseases, share the same cause: a repeat expansion on chromosome 9, known as C9orf72. Using Drosophila, it was investigated what it is about this repeat that causes the disease. There were three possibilities: that the repeat RNA becomes toxic, that the proteins it generates are toxic, or that the loss of function in the C9orf72 gene is detrimental. It was determined that the primary contributor to the toxicity of the mutation is the proteins produced by the repeat RNA (Mizielinska et al, 2014, Science 345:1192-4).